Published: Thursday, April 19, 2012 at 10:09 p.m.
For the third straight year, P.K. Yonge’s Jazz Whittaker has flourished at the FHSAA Class 1A state tennis tournament. On Thursday at Red Bug Lake Park in Casselberry, the 6-foot junior captured the state title on the team side of the bracket at No. 1 singles. Whittaker, The Sun’s 2011 player of the year, got by Jacquelyn Fitz-Randolph of Tampa Carrollwood Day, 7-6 (7-2), 6-1 in the finals. She will now face Delray Beach American Heritage’s Rasheeda McAdoo, the winner on the individual side of the draw, for the overall state title today at 8 a.m. McAdoo is the daughter of former NBA MVP Bob McAdoo, who is currently an assistant coach for the Miami Heat. A year ago, Whittaker teamed with Kiah Turner and the duo won the Class 1A state title on the individual side of the doubles bracket. In 2010, the pair won the state title at No. 2 doubles. As for the team, the Blue Wave, making their second state tournament appearance in three years, placed third out of eight teams with six points. P.K. Yonge’s No. 2 doubles team of Turner and Marcela Ifju lost in the semifinals on Thursday. The Gainesville High boys team placed third in the Class 3A state tournament at Sanlando Park in Altamonte Springs. Peter Slaton led the Hurricanes as the sophomore won a state championship at No. 3 singles. Slaton rallied to knock off Paul Johnson of Naples Barron Collier 0-6, 6-4, 7-5. Zach Goldberg, The Sun’s 2011 player of the year, lost to Arsav Mahonty of Bradenton Lakewood Ranch 6-3, 7-6 (7-4) in the final at No. 2 singles. Cole Fiegel and Goldberg lost in the semifinals at No. 1 doubles, while Slaton and Justin Zambelli bowed out in the semifinals at No. 2 doubles. The Hurricanes, who were sixth out of eight teams at state a year ago, finished third this time around. Published: Friday, June 1, 2012 at 11:00 p.m. Note: This is the second in a series of The Sun’s spring sports all-area athletes of the year, selected with the help of coaches. 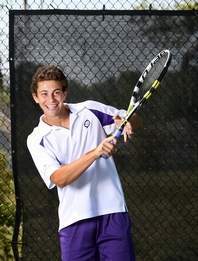 Zach Goldberg, Gainesville, junior: Claimed the District 5-3A title and was the state runner up at No. 2 singles with a 20-1 record. Was also 16-3 and a district champion and a state semifinalist at No. 1 doubles with Cole Fiegel. Cole Fiegel, Gainesville, junior: The lefty finished 16-3 and won the District 5-3A crown at No. 1 singles. Was also 16-3 and a district champion and a state semifinalist at No. 1 doubles with Zach Goldberg. Erik Vincek, Buchholz, senior: Posted an 16-2 record for the district champion Bobcats; claimed the District 1-4A crown at No. 1 singles and advanced to the Class 4A state tournament semifinals as an individual. Frazier Springfield, Eastside, senior: Ended with a 10-5 record at District 5-2A championship at No. 1 singles, and was 10-5 at No. 1 doubles with Jon Yoo as the Rams reached the state tournament for the second time in three years. Alex Vlasak, Buchholz, senior: Was 12-3 and the District 1-4A champion at No. 2 singles and advanced to the Class 4A state tournament semifinals with Erik Vincek at No. 1 doubles (14-2). Peter Slaton, Gainesville, sophomore: Turned in a perfect 16-0 record and won the District 4-3A title before claiming the state championship at No. 3 singles. Camille Kima, Eastside, freshman: Was 11-5 and won the District 5-2A crown at No. 2 singles and was 10-5 and a district champ at No. 2 doubles as the Rams qualified for state as a team. Andrew Irani, Buchholz, freshman: Posted a 11-5 record at No. 3 singles for the district champion Bobcats. Derek Li, Eastside, freshman: Finished with a 13-2 record at No. 4 singles for the district champion Rams, who placed sixth as a team at the Class 2A state tournament. Harrison Thibault, Oak Hall, freshman: Despite a 4-10 record, he claimed the District 4-1A title at No. 1 singles to clinch a Class 1A state tournament berth; also qualified for state at No. 1 doubles with Apurv Suman. Jon Yoo, Eastside, senior: Turned in a 13-2 record to win the District 5-2A crown at No. 3 singles and was 10-5 at No. 1 doubles with Frazier Springfield as the Rams reached the state tournament for the second time in three years. Peyton Nimmons, Buchholz, sophomore: Was 11-5 at No. 4 singles for the district champion Bobcats. Apurv Suman, Oak Hall, senior; Nick Gallman, Santa Fe, junior. The veteran coach guided the Hurricanes to an 14-2 record, which included winning the District 5-3A title, for its second straight district crown. GHS also breezed through both of its regional playoff matches and clinched its second consecutive trip to the FHSAA Class 3A state tournament. The ‘Canes ended up finishing third out of eight teams at state. Peter Slaton claimed the state title at No. 3 singles to highlight GHS’ trip to Sanlando Park in Altamonte Springs. Spradling, who takes home this award for the second consecutive year, also led GHS to the Class 5A state title in 1996 and to a share of the state championship 1998. Jazz Whittaker, P.K. Yonge, junior: Posted a 14-1 record singles record, claimed the District 4-1A crown at No. 1 singles and No. 1 doubles and qualified for state; captured the FHSAA Class 1A state title on the team side of the bracket at No. 1 singles. Kiah Turner, P.K. Yonge, sophomore: Finished 16-1 and won the District 4-1A title at No. 2 singles and reached the state semifinals at No. 2 singles. Chrissie Reichert, Columbia, senior: Was 15-4 at No. 1 singles and won the District 5-3A title to clinch an individual berth to the Class 3A state tournament. Abigail Vlasak, Oak Hall, freshman: Turned in a 10-4 record at No. 1 singles and helped lead the Eagles to their second straight regional-playoff appearance. Lillie Mehan, Eastside, freshman: Turned in a 20-1 record at No. 1 singles, won District 5-2A title to clinch state tournament berth, also led the Rams to the regional playoffs for first time since 2005. Courtney Cribb, Buchholz, sophomore: Compiled an 11-3 mark at No. 1 singles and a 14-2 record at No. 1 doubles for the Bobcats. Jean Saltivan, St. Francis, senior: Was 10-5 at No. 1 singles and was the District 4-1A runner up for the Wolves. Madison Sagas, P.K. Yonge, seventh-grade: Posted a 11-2 mark at No. 3 singles and claimed the District 4-1A title at No. 1 doubles with Jazz Whittaker. Selin Yaylali, Oak Hall, sixth-grade: Finished as the District 4-1A runner up at No. 2 singles with a 9-2 record for the Eagles. Allie Sourakov, Eastside, sophomore: Was 16-1 and was the District 5-2A runner up at No. 2 singles for the Rams. Mara Lance, Suwannee, senior: District 2-2A champion at No. 3 singles with a 12-2 record; was 10-1 and district runner-up at No. 2 doubles. Caroline Karafa, Buchholz, senior: Claimed the District 1-4A crown at No. 4 singles, finishing with a 10-4 mark, while also posting a 10-6 record at No. 2 doubles for the Bobcats. He takes home this award for the second time in three seasons. Taylor guided the Blue Wave to a 7-3 record and to their fifth straight district championship and also steered P.K. Yonge back to the FHSAA Class 1A state tournament for the second time in three years. At the state tournament held at Red Bug Lake Park in Casselberry, the Blue Wave finished third out of the eight-team field. Highlighting P.K. Yonge’s trip to state was No. 1 singles player Jazz Whittaker who captured the Class 1A state title on the team side of the bracket, before falling in the overall state title match. Note: The Gainesville Sun all-area teams, player of the year and coach of the year were selected by Cliff Olsen with help from area coaches and Sun high school sports editor Larry Savage. If a team is not represented, it is because the coach did not respond to e-mails sent to the school requesting information and numerous reminders in the newspaper. The 6-foot-2, 185-pound senior, who was The Sun’s player of the year as a freshman in 2009, almost didn’t play his final season of high school tennis. While Vincek admitted to being burned out on the sport and thought about quitting prior to the season, his best friend and doubles partner Alex Vlasak and Bobcats interim coach Jay Godwin convinced him otherwise. Things worked out for Vincek, who posted a 16-2 mark at No. 1 singles, losing just five sets all season. He claimed his third consecutive district title at No. 1 singles, clinching his third straight trip to the FHSAA Class 4A state tournament. Vincek also earned the top-seed on the individual side of the draw and reached the state semifinals. At No. 1 doubles, Vincek and Vlasak, “The Killer Vs” as they are called by Godwin, finished with a 14-2 record. The duo captured the District 1-4A title and advanced to the state semifinals. Vincek is ranked 10th in the state in the boys 18 rankings, according to the USTA’s May rankings. Vincek is still a big fan of the Rubik’s Cube. Although, he said there was a while where he didn’t pick up the 3-D puzzle, he can still solve it in about 35 seconds. Vincek, who has a 4.35 weighted GPA, is planning to attend Florida in the fall and hopes to be involved with the Gators men’s tennis team. “I had an interview with Andy Jackson the (then) UF coach and he said it would be really tough to make the team, so I kind of lost a lot of confidence there,” Vincek said. “I really wanted to go to UF and play for their team (as a walk on). He didn’t say yes or no, he just said you might be able to, but he was kind of hinting that you’re probably not. I pretty much got the message. “I was pretty happy. I put my whole life into it. I think that was one of the things (the player of the year award) in my mind, let’s give it one last try. I started as the player of the year and then end as the player of the year, that would be nice. I did it, so that’s great.”- Erik Vincek. “I definitely lost my love for the game a little bit, I didn’t even want to touch a racket,” Vincek said. “They (Vlasak and Godwin) both really motivated me to keep on playing and helped me realize that I am not going to stop playing tennis and that I love it. For the fifth straight year, a P.K. Yonge girls tennis player takes home this award. The 6-foot Whittaker wins this award for the second straight year. She turned in a 14-1 mark, which included winning her second straight District 4-1A title at No. 1 singles. She followed with a pair of regional victories in leading the Blue Wave to their second FHSAA Class 1A state tournament appearance in three years. At the state tournament held at Red Bug Lake Park in Casselberry, Whittaker claimed the state title at No. 1 singles on the team side of the bracket. Although she fell to Delray Beach American Heritage’s Rasheeda McAdoo in the overall state title match, Whittaker became the first area girls tennis player to play for an overall singles state championship since Eastside’s Amanda Field was the Class 4A runner-up in 1998. Whittaker and Madison Sagas also won a district title at No. 1 doubles for the Blue Wave, which placed third at state as a team. Last spring, Whittaker teamed with Kiah Turner and the duo won the Class 1A state title on the individual side of the doubles bracket. In 2010, Whittaker and Turner won the Class 1A state crown at No. 2 doubles. Whittaker is ranked 58th in the state in the girls 18 rankings, according to the USTA’s May rankings. She played volleyball for P.K. Yonge as a sophomore, but decided to switch fall sports as a junior. Instead she was a member of the Blue Wave swim team this past fall. Whittaker was an honorable mention all-area selection in the 100 breast stroke and swam on the 200 medley relay team. Whittaker said she did that for cross training and to build more muscle. Whittaker said that she plans on playing tennis for a Division-1 school at the collegiate level and has started to generate interest from schools. The right-hander lists her kick serve, her forehand and her net game in general as her strengths. “I kind of forgot about the award I wasn’t really thinking about it too much. I think I was in History class, I was in school (when I received the message about winning the award). I was goofing around with my friends and said, ‘Winning.’ They were like, what did you win this time? I told them tennis player of the year. Mr. Bourn is my teacher and we were doing busy work. I am goofy and they are used to it.” — Jazz Whittaker. 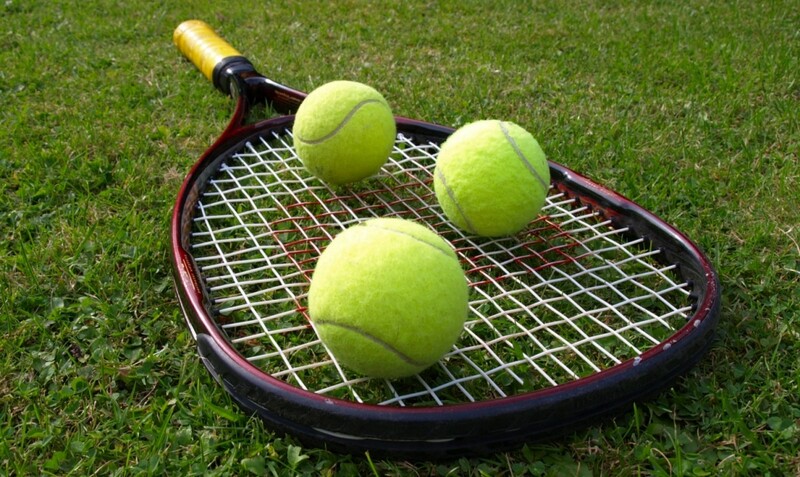 Published: Sunday, April 15, 2012 at 11:44 p.m.
Three area tennis teams and a handful of area individual players will be heading down to the state tournament in Altamonte Springs and Cassellberry starting today. The Gainesville High boys squad are making their second straight trip to state, while the Eastside boys and the P.K. Yonge girls are returning to the big stage for the second time in the last three years. The Hurricanes led by Cole Fiegel, The Sun’s 2010 player of the year and Zach Goldberg, The Sun’s 2011 player of the year, cruised through its two regional matches last week. GHS, which placed sixth out eight teams at last year’s FHSAA Class 3A state tournament, opens play on Wednesday with almost its entire team from last spring. The lefty-serving Fiegel (17-2), who said he has been battling tendinitis in his left shoulder, is at No. 1 singles, followed by Goldberg (19-0) at No. 2 singles. The pair play together at No. 1 doubles. Peter Slaton, Jacob Gordon and Justin Zambelli round out the three remaining singles positions, with Slaton and Zambelli set as the GHS No. 2 doubles team. Naples Barron Collier, the two-time defending state champions and winners of five of the last seven Class 3A state titles are the favorites. Eastside, which also coasted through its two regional matches, begins action today at the Class 2A state tournament. The Rams are paced by Frazier Springfield at No. 1 singles, followed by Camille Kima, Jon Yoo, Derek Li and Max Curtis, rounding out the singles lineup for coach Dave Porter’s club. Springfield and Yoo play at No. 1 doubles, with Kim and Austin Gillete penciled in at No. 2 doubles. The P.K. Yonge girls squad, which is fueled by Jazz Whittaker, The Sun’s 2011 player of the year and Kiah Turner, at the top two singles spots, starts Class 1A state tourney action on Wednesday. 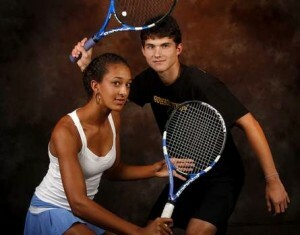 Although Whittaker and Turner are not playing doubles together this season, they both have state tournament experience. A year ago, the duo won the FHSAA Class 1A state title on the individual side of the doubles bracket. In 2010, the pair won the Class 1A state crown at No. 2 doubles. Madison Sagas is at No. 3 singles, with Marcela Ifju and Darby Townsend at the other two singles spots. Whittaker and Sagas play No. 1 doubles, while Turner and Ifju are at No. 2 doubles. As for the area’s individuals, who earned individual state tournament berths by winning district titles at No. 1 singles and No. 1 doubles, Erik Vincek of Buchholz will be a part of the Class 4A singles tournament. He’ll also play doubles with Alex Vlasask. This is Vincek’s third straight trip to the state tournament as an individual. Columbia’s Chrissie Reichert, who reached state each of the last two years along with the rest of her Columbia teammates, will be playing individually in the Class 3A tournament. Eastside’s Lillie Mehan will be part of the individual singles draw in Class 2A. Harrison Thibault of Oak Hall will be in singles action in Class 1A and will play doubles with Apurv Suman. 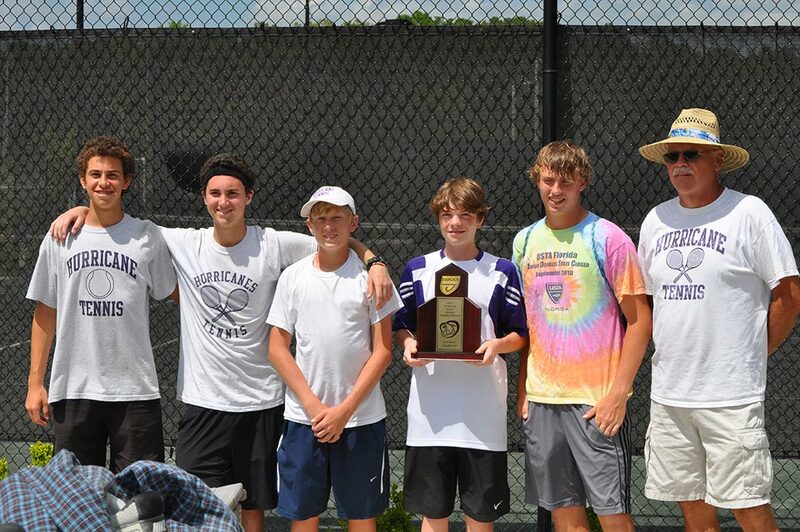 Published: Wednesday, April 18, 2012 at 11:00 p.m.
Gainesville High School boys tennis coach Paul Spradling said he was excited to see how his team would perform at the FHSAA Class 3A state tournament at Sanlando Park in Altamonte Springs. After Wednesday’s opening-day action, the veteran coach is pleased as the Hurricanes, in their second straight trip to state, have six points and are tied with Bradenton Lakewood Ranch and Stuart Martin County. Naples Barron Collier, the two-time defending state champions, lead after day one with 11 points. Goldberg, The Sun’s 2011 player of the year, breezed through his quarterfinal and semifinal matches at No. 2 singles, dropping just one game in his pair of straight-set wins. Goldberg will be playing for a state title today as will No. 3 singles player Peter Slaton, who got through the quarterfinals and semifinals matches. Both of the Hurricanes doubles teams, No. 1 Cole Fiegel and Goldberg and No. 2 Slaton and Justin Zambelli, posted quarterfinal victories and will be in semifinal action today. On the individual girls side of the Class 3A state tournament, Columbia’s Chrissie Reichert lost her opening-round match in straight sets. The P.K. Yonge girls team also had a good day at the Class 1A state tournament at Red Bug Lake Park in Casselberry. The Blue Wave are in third place with five points, behind Boca Raton St. Andrew’s (11) and Miami Ransom Everglades (10). Jazz Whittaker, The Sun’s 2011 player of the year, rolled to a pair of straight-set wins and will be playing for a state title today at No. 1 singles. The Blue Wave’s No. 2 doubles team of Kiah Turner and Marcela Ifju reached today’s semifinal round after a straight-set quarterfinals win on Monday. In the Class 1A individual tournament, Oak Hall’s Harrison Thibault fell in straight sets. Thibault and Apurv Suman defaulted in their quarterfinals doubles match. Suman, who recently was accepted to Yale, was at pre-orientation and was not able to get back in time, according to Eagles co-coach Tom Simpson. The Gainesville High School boys tennis team cruised to its second straight district title on Day 2 of the District 5-3A tournament, Tuesday at the Jonesville Tennis Center. The Hurricanes stormed through the field, claiming each of the five singles positions and both doubles slots. On the girls side, Columbia’s Chrissie Reichert won the district title at No. 1 singles and clinched an individual state tournament berth. Cole Fiegel, The Sun’s 2010 Player of the Year, and Zach Goldberg, last year’s Player of the Year, each posted straight-set wins at No. 1 and No. 2 singles, respectively. Fiegel and Goldberg didn’t lose a game as they teamed up to win the No. 1 doubles title. Peter Slaton, Jacob Gordon and Justin Zambelli each rolled to wins at No. 3, No. 4 and No. 5 singles. Slaton and Zambelli also took the No. 2 doubles title. “I thought we had a pretty good day. We swept the district,” Goldberg said. “Everyone on our team won all of their matches — singles and doubles. I don’t think it could have gone much better. The Hurricanes, who reached the state tournament last year for the first time since 2007, will host a Class 3A first-round regional match on Tuesday. Ocala Forest, the district runner-up, will be on the road for the opening round. Reichert, who reached state with her Tigers teammates the last two years, was the only area girls player to move on after pulling out the district title. As a sophomore, she won a district title at No. 2 singles, but this was her first district title at No. 1 singles. DISTRICT 5-2A: At Crystal River, the Eastside boys tennis team also made it a clean sweep in grabbing its first district crown since 2010. Frazier Springfield titled at No. 1 singles, while Camille Kima, John Yoo, Tabong Kima and Max Curtis claimed district titles and No. 2-5 singles. Springfield and Yoo won at No. 1 doubles, with the Kima brothers taking the No. 2 doubles title. The Rams, who clinched their third straight regional playoff appearance, will host a first-round regional match on Tuesday. On the girls side, the Rams finished as the district runners-up, two points behind Crystal River, and clinched their first regional playoff appearance since 2005. Lillie Mehan captured the district title at No. 1 singles and clinched an individual state tournament berth, while Amaleah Mirti claimed the district title at No. 4 singles to lead the way for the Rams. Eastside will be on the road for its first-round regional match on Tuesday.